The pastel on the cover of the current Liotard exhibition catalogue, and one which has understandably drawn a great deal of attention, is a delightful picture of a little girl with her doll lent by the Schönbrunn in Vienna. The catalogue entry (suffering from space limitations) tells us that the sitter is Marianne Liotard (1767–1830), the artist’s youngest child, and notes that the identification is based on an entry in her brother’s missing diary; it quotes the description from this diary: “De son doigt elle fait signe de garder le silence, sa poupée étant endormie.” This is said to come from a madrigal: strictly I think it is supposed to be the brother’s commentary on the madrigal, but that too is missing. 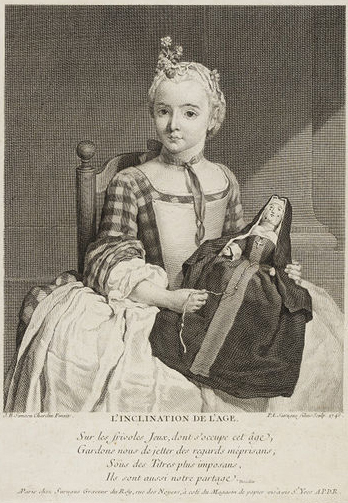 The catalogue correctly goes on to highlight the problem with the picture: the girl appears to be about five, but Liotard left Geneva at the end of 1770 (age 3) and didn’t return until October 1774 (age 7). Noting the difficulty, the catalogue opts for “c.1775” as the date. After a short discussion of the nature of genre v portraiture and a brief mention of Chardin as a possible source, the entry concludes with another mystery: how did the pastel enter the Austrian imperial collection (where its entry was unrecorded), speculating that it was a gift from the artist to Maria Theresia. That in a nutshell is the conundrum. Roethlisberger & Loche have a much longer discussion of these issues (R&L 506, p. 629, also opting for the later date by placing the work in the chapter on “Genève 1774–1777”) – and of course more similar pictures of children with dolls. The lost Chardin picture was surely in oil, not pastel; it is known from the Surugue engraving entitled L’Inclination de l’âge (misprinted elsewhere: note that inclination and inclinaison do not mean the same, nor does the title translate into English as readily as some think), which may encourage the idea that this was a genre piece; but the 1738 salon livret makes it perfectly clear that the original was a portrait, of “la fille de M. Mahon, marchand, s’amusant avec sa poupée”. R&L note that the “pose de la tête est semblable”, although Chardin’s sitter looks at us directly, while the innovation in Liotard’s pastel is the lost look. The Chardin picture is also extremely complicated in ways this blog is too short to explore; but perhaps a more relevant parallel is with a virtually contemporary drawing by Liotard’s arch enemy, Charles-Nicolas Cochin, which I published some years ago (in my 2001 GBA article on the abbé Pommyer). 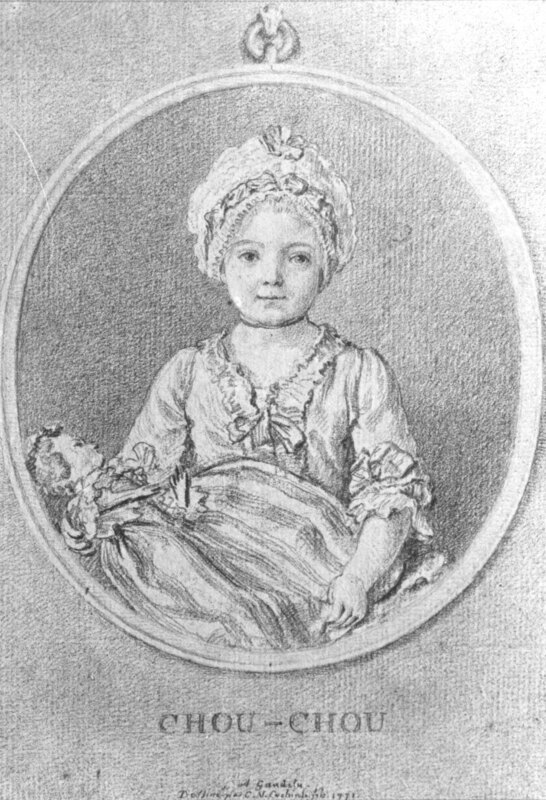 The charming Chou-Chou, dated 1771, depicts Pommyer’s great-niece Élisabeth d’Incourt de Fréchencourt, later baronne de Jacquier de Rosée, so we know the girl was four; while technically not as ambitious as the Liotard, the drawing displays a freedom and informality which underlines the mutual incomprehension between the two artists. Un “Madrigal adressé à Monsieur Liotard à l’occasion du Portrait de sa Fille Cadette, par M. Bocconi” fait allusion à ce tableau. Dans un notice explicative, l’auteur précise: “De son doigt…[etc. ]” Bocconi, Italien catholique, avait changé de religion à Genève; avait beaucoup d’éducation. And a week later he married Marie-Henriette Corriger, daughter of a bourgeois of the city. So what does this mean? Liotard returned to Geneva on 12 October 1774. It is scarcely credible that he could have finished this pastel (see my earlier blog for how long he took to do a repetition of Mme Necker) in time for Bocconi to see the finished work and write a cheery madrigal (or was it perhaps a poem designed to be placed under the image, as Surugue engraved verses from Chardin’s friend Pesselier?) before going off to Montpellier and then getting to Lyon in time to die (there is no need to speculate about the possible progression of the illness he had in London, perhaps consumption, as he was only 35, or whether he travelled to Montpellier for its renowned medical school). But isn’t there a much simpler explanation? Without the diary entry in front of us, how do we know that it specifically identifies Marianne rather than her elder sister Marie-Thérèse? No other pastel of her is known, so the eye colour cannot be compared; there is nothing in the other portraits that would rule her out (or in). Her dates (1763–1793) work perfectly: Bocconi was in Geneva in 1768–69 when the pastel could easily have been made. Bocconi’s madrigal merely identifies the girl as of the “fille cadette”, but he might simply have meant to distinguish her from the eldest girl Mariette (1761–1813) [see postscript below]. Maybe Trivas simply read to much into the title. What seems to me the most important point is that Maria Theresia was godmother to Marie-Thérèse Liotard: surely it would have been the most natural thing to send the empress the portrait of her godchild – and, conversely, rather bizarre to send her a portrait of one of the children who was not? Of course it is possible that Liotard sold it to her as a genre piece (that after all was why she bought Suzanne Necker à la livre, although she certainly knew the sitter’s identity), but there is no record of a purchase, and for me the idea of a gift, and of the right daughter, feels more plausible. As for a gift of the wrong one, what was Liotard planning to say to the Empress had she asked: is that my goddaughter? Arguments based on determining age from visual appearance in portraits are seldom as reliable as documentation; but without the missing diary we may never get to the bottom of this, and whether Trivas made an unwarranted inference from it (or even if, since he seems to have been writing later, Liotard fils himself was confused). But I think it highly probable that the pastel belongs to an earlier chronological chapter; and it seems plausible that we have also got the wrong daughter. I am most grateful to Catriona Seth for pointing out that “cadette” strictly speaking refers to the second daughter; Marianne was in fact the “benjamine”. Whether each of Bocconi, Liotard fils and Trivas followed such niceties is less certain. Princess Caroline, on the left, is 3; Louisa Anne, on the right, is 5 (according to R&L; the RA catalogue unaccountably states that she is 6, which only makes the problem worse). As usual R&L should be the starting point. The Livres des habitants de Genève 1684–1794 was published in 1985 by the Société d’Histoire et d’Archéologie de Genève, edited by Alfred Perrenoud with Geneviève Perret; but you can also find the documents reproduced above directly through the Base Adhémar. Bonstettiana: historisch-kritische Ausgabe der Briefkorrespondenzen Karl Viktor von Bonstettens und seines Kreises 1753 – 1832 is part of the monumental series edited by Doris and Peter Walser-Wilhelm published in Bern (not technically German, but admirably thorough). I have also quoted from Gisela Luginbühl-Weber’s Johann Kaspar Lavater, Charles Bonnet, Jacob Bennelle: Briefe 1768-1790; ein Forschungsbeitrag zur Aufklärung in der Schweiz, I, 1997, p. 37; see also Biologia e religione nel Settecento europeo: la corrispondenza tra Alfonso Bonfioli Malvezzi e Charles Bonnet, 1773-1788, ed. Sandro Cardinali, 1998. My article on Pommyer, La Tour and Cochin was « L’abbé Pommyer, honoraire amateur de l’Académie royale de peinture », Gazette des beaux-arts, mai–juin 2001, CXXXVII, n° 1588–89, pp. 237–56; parts of it can be found in my essay.